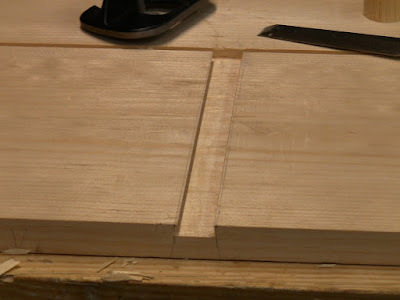 Before assembling the case, the next steps were grooving it all around for the plywood bottom sheet, and fitting the center divider with sliding dovetails. 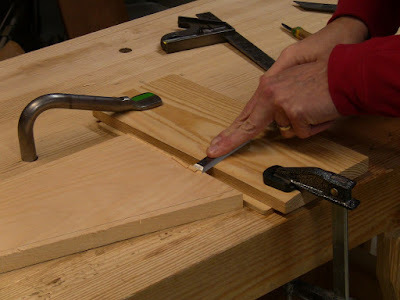 You can see the detailed procedure for making a sliding dovetail on this page. 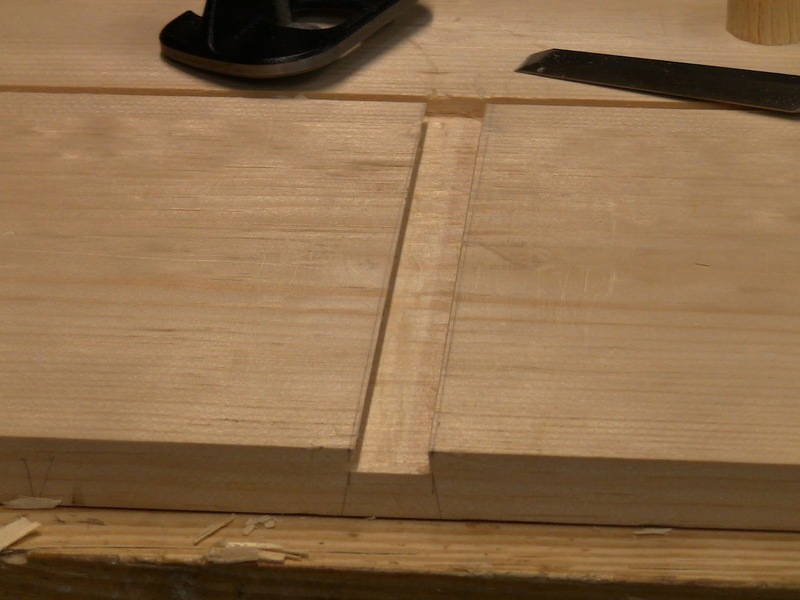 This was an important joint, because I wanted the divider to hold the back stiff when the case was carried hanging by the handle in back. A simple dado would not provide any mechanical support, the back would pull away from the divider. Sharpening the 1/4" iron for my plow plane, using a DMT coarse diamond plate, 1,000 and 10,000 grit Ohishi ceramic waterstones, and a strop. The front and back grooves are stopped, so the skate on the plow plane prevents reaching all the way to the end. 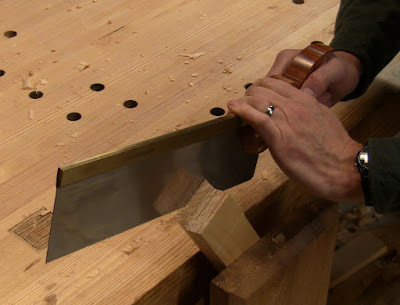 Using the plow iron as a chisel to plow out the last couple inches. Crosscutting the walls of the sliding dovetail, stopped at the groove. Precisely leveling the floor with a small router plane. Using an angled guide piece to precisely pare the dovetail tongue. 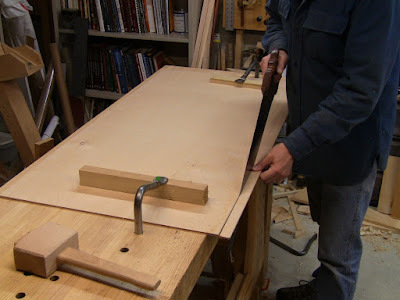 Sliding the divider into the back. 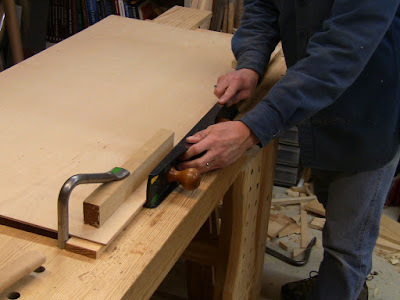 Cutting the plywood bottom to size. Handsaws work just fine on plywood. The thin cross grain veneer layers are just a bit more finicky to deal with than solid wood. Shooting the plywood edge straight and square. 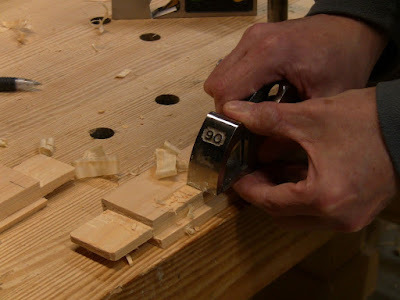 Handplanes also work just fine on plywood. 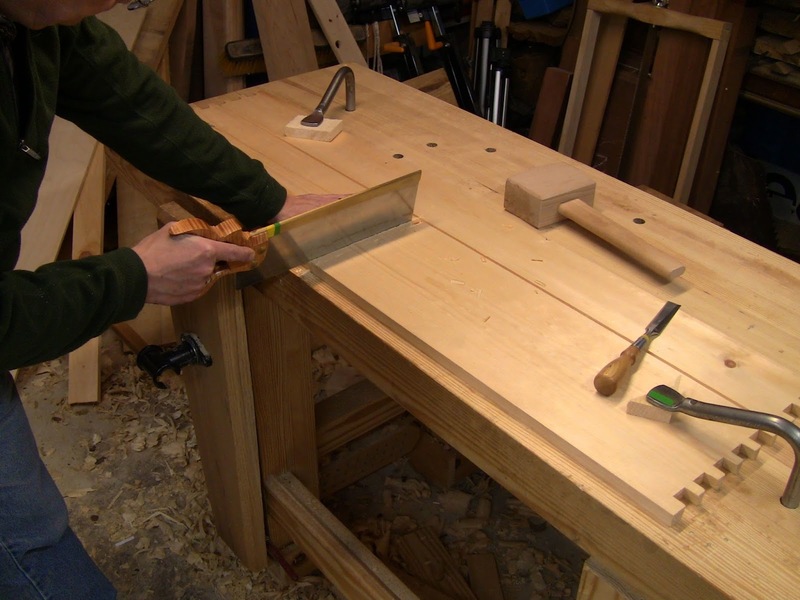 The next step was making the door frames, using drawbored mortise and tenon joints. 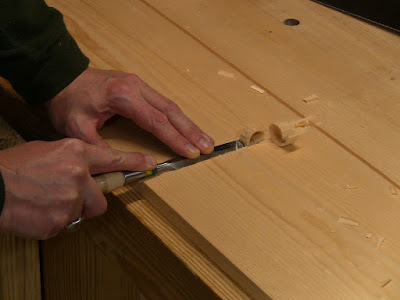 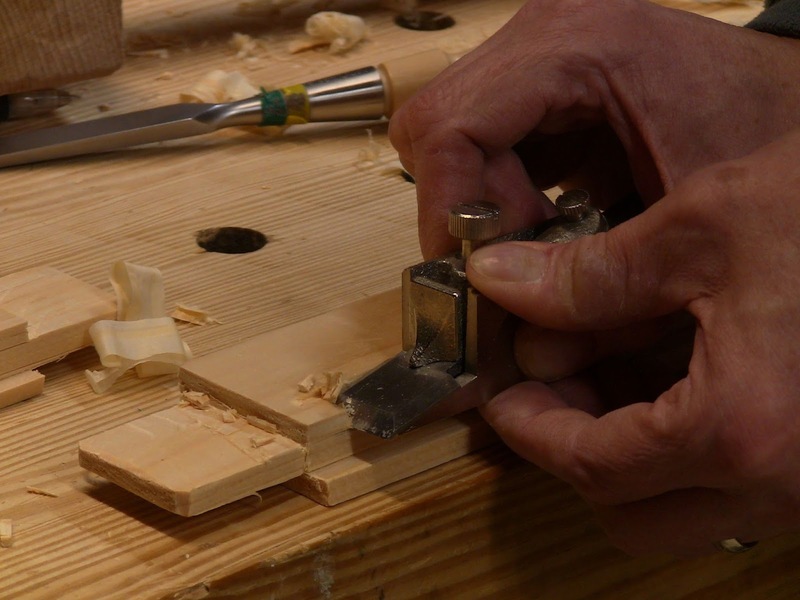 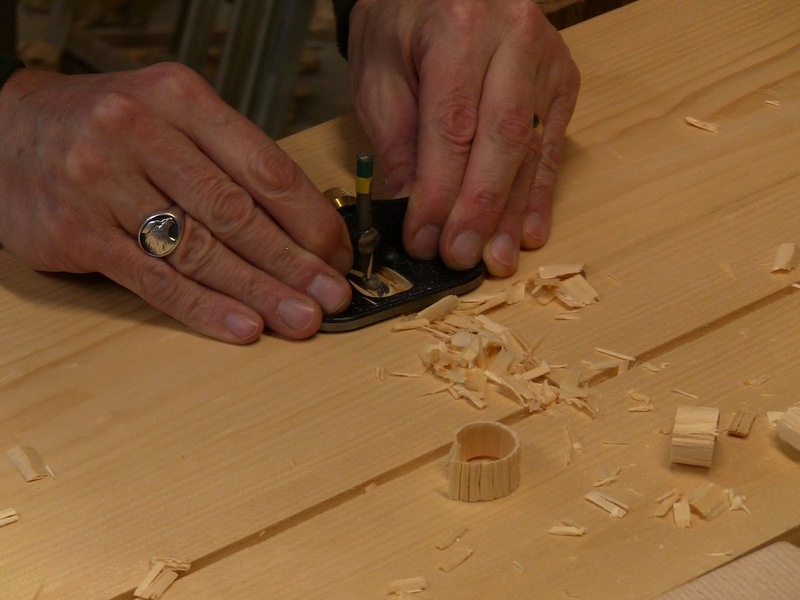 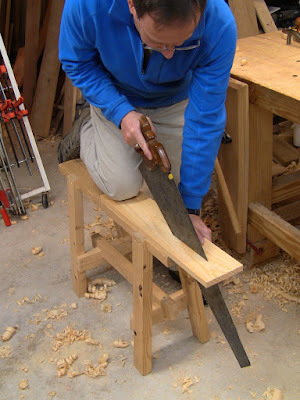 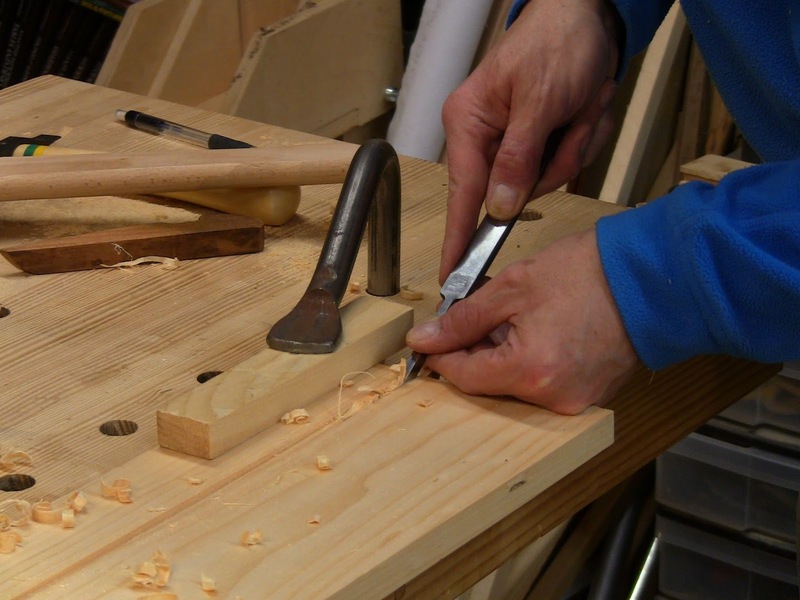 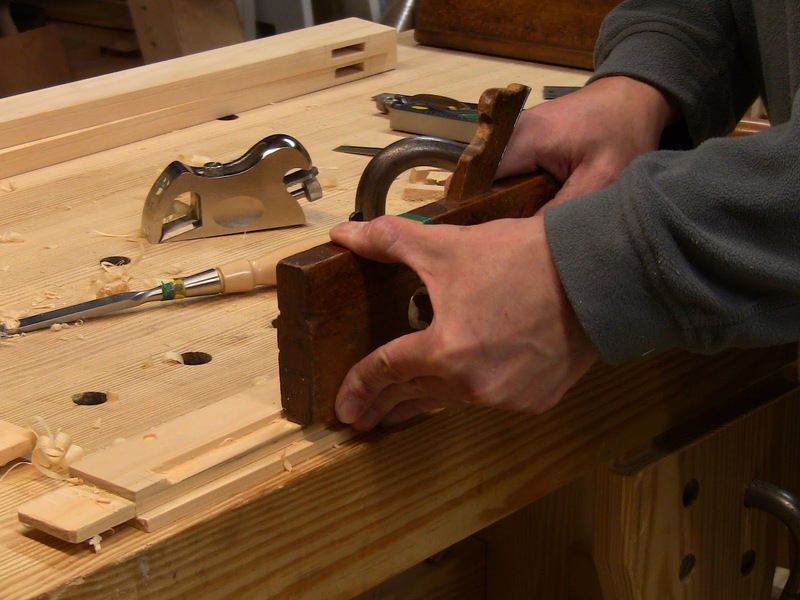 For details on how to make the basic mortise and tenon, see this page. 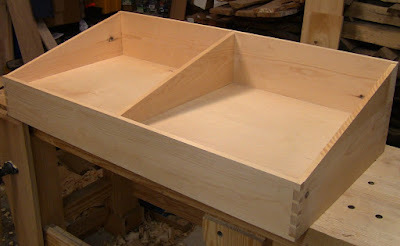 Drawboring is amazing. The resulting joint feels as solid and strong as if the wood had grown that way, like the branch attached to the tree. 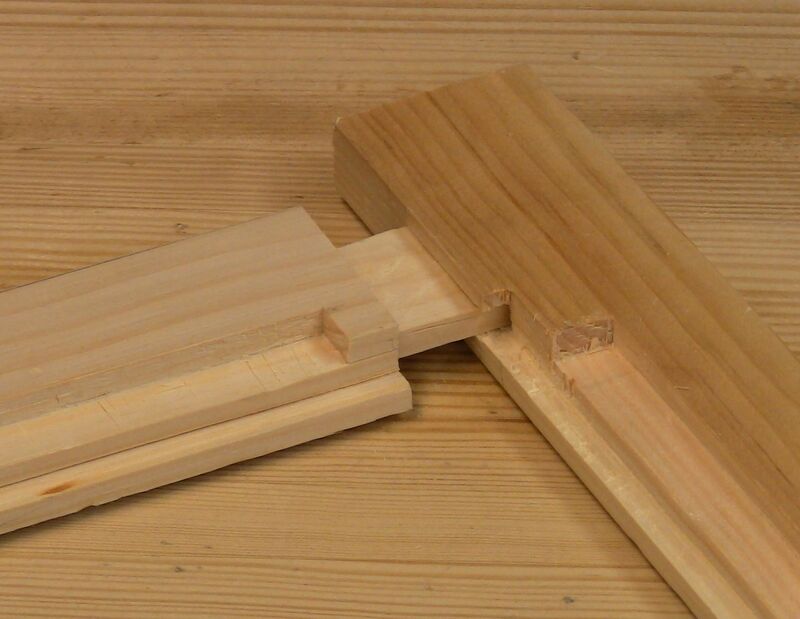 Rather than a groove, the frames had a double rabbet to hold the clear acrylic. 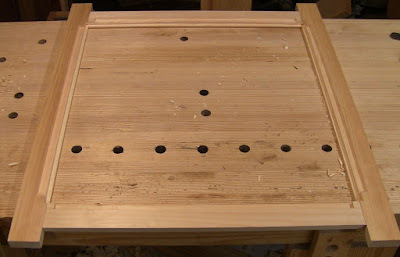 This was then held in place with thin oak backer strips screwed in. 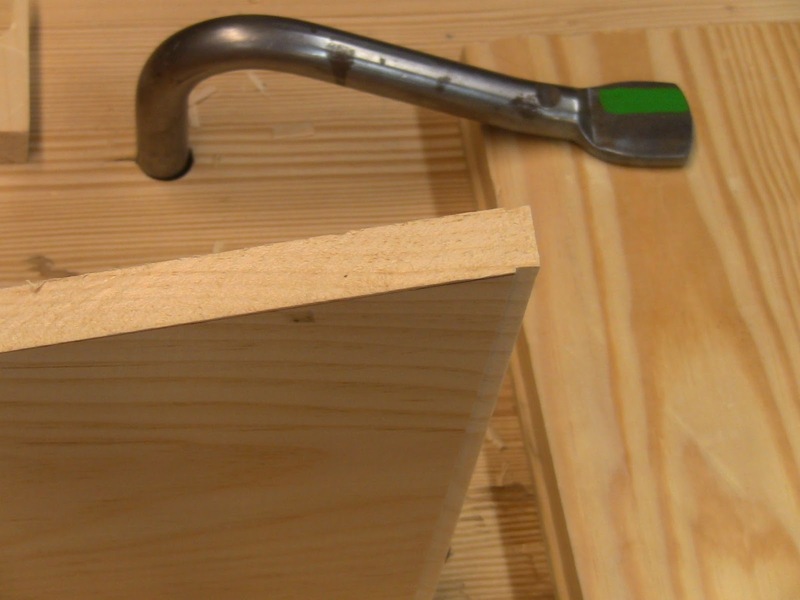 Should an acrylic piece need replacement, the backer strips can be unscrewed to remove it. Ripping the frame rails and stiles. 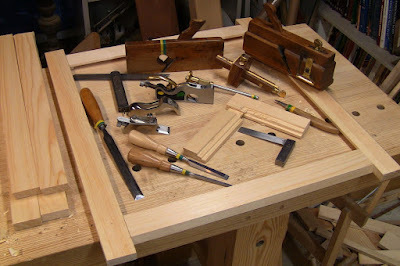 The first frame dry fit, with horns still on, and all the tools required. 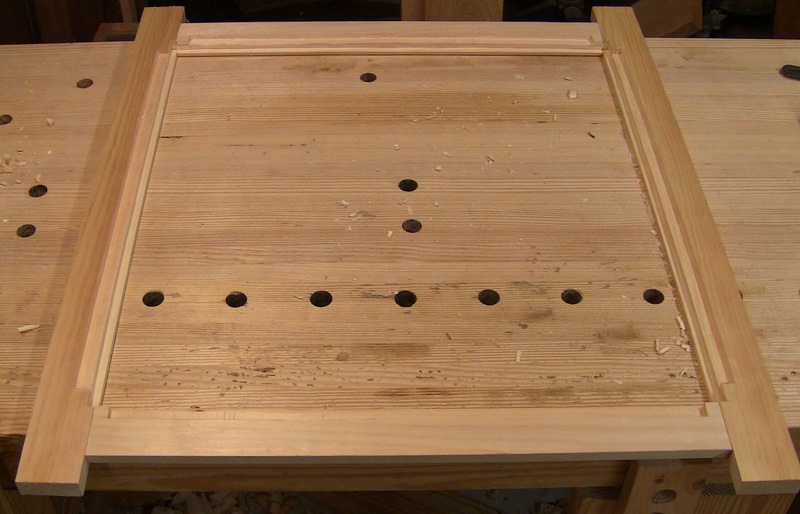 The stepped rabbet on the back of the frame. 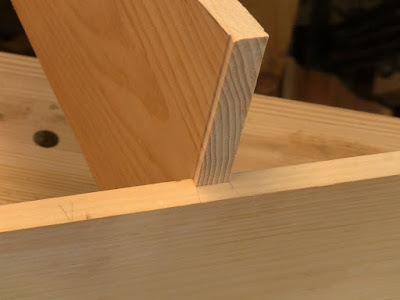 Closeup of one of the joints. Closeup of mortising the second frame. 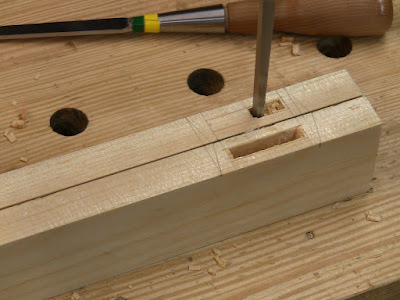 Sawing the corners of a tenon cheek. 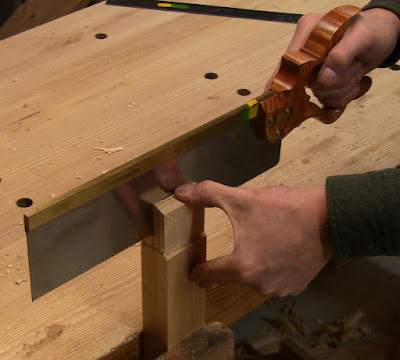 Sawing off the remaining tenon cheek waste. 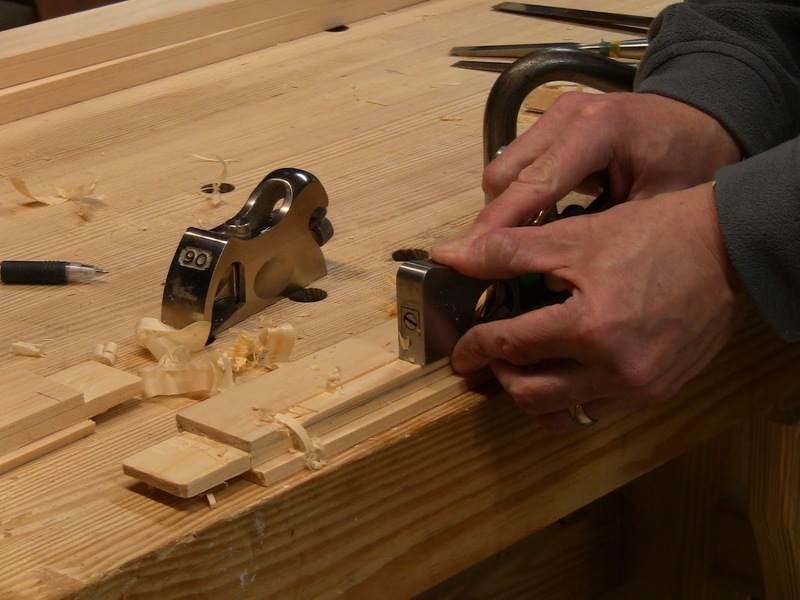 First step forming the rabbet, the big fast tool is the moving fillister plane. The second rabbet is stopped. 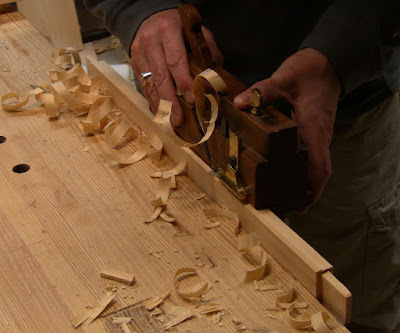 Using a bull-nose shoulder plane to get up close to the end. 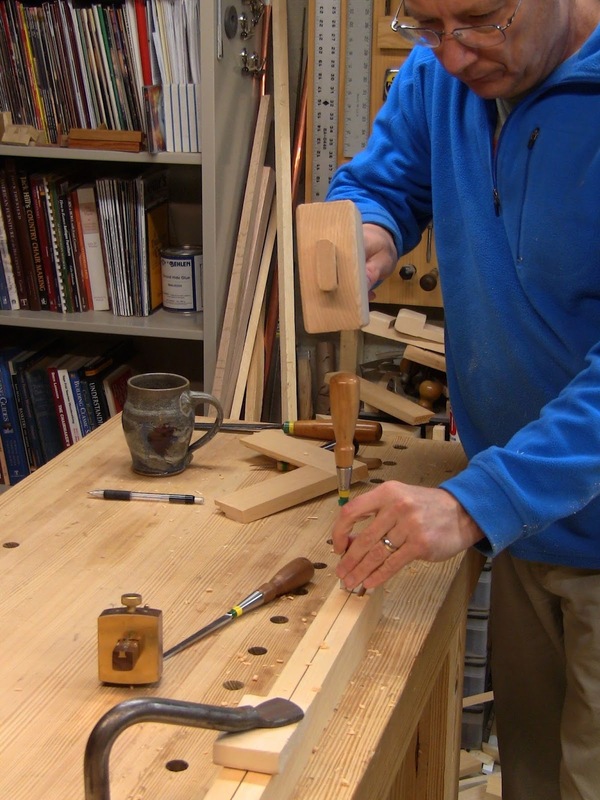 Using a better shoulder plane for the bulk of the rabbet. 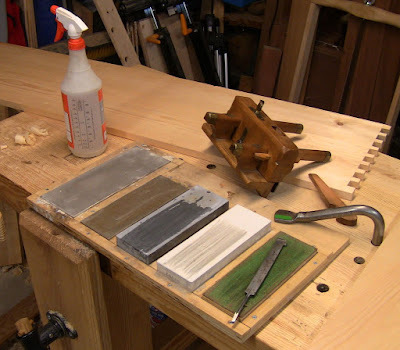 Where I have room, using a wooden skew rabbet for fast stock removal. 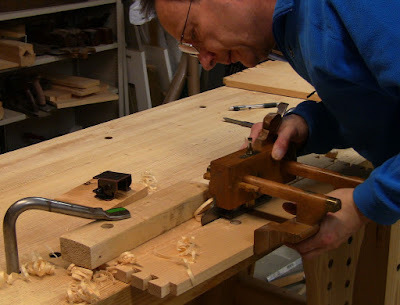 With the bull-nose removed, using the shoulder plane as a chisel plane to get right up into the corner.